OE style reproduction of the original trunk light assembly. 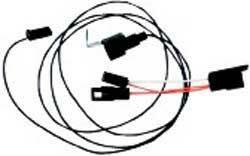 Each harness will replace your existing non-working harness or can be used to install a new GM type trunk lamp assembly. Note: Convertible and coupe har nesses include the extension wire. Classic Industries® offers the largest selection of in stock replacement wiring harnesses available anywhere! Our harnesses are reproduced using the original General Motors schematics and feature the correct attachment connectors and wire in the correct gauge sizes and coloration (when available) to match your original and maintain authenticity.